Families will attend a 4-class series including nutrition, fitness, and cooking education. Each family will be given a slow cooker, meat thermometer, and 4 bags of nutritious groceries. 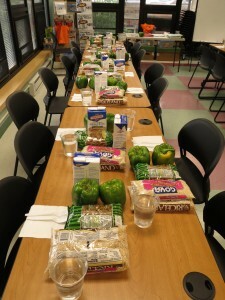 Families will also enjoy a light, healthy meal together as part of each class. Family exercise programs will include gentle yoga, stretching, aerobic activities like jumping jacks, and other exercises that can be done in a small space. In addition, families will share ideas about how to incorporate more physical activity into their daily routines. Adult nutrition and cooking classes will demonstrate how to make inexpensive, delicious meals in a slow cooker while participants learn strategies for increasing their consumption of fruits and vegetables, whole grains, lean and plant-based proteins, and home cooked meals. Families will also learn tips for portion control, the importance of breakfast and healthful ingredient substitutions to improve the nutrition profile of their family favorites. Click here to see how Family Program alumni from 2012 have increased consumption of nutritious foods, physical activity and energy and healthy while saving money on food. Classes will be held from 6 – 7:45pm on Wednesdays September 25, October 9, 23 and 30 at Kingsley Elementary School at 2300 Green Bay Rd, Evanston, IL 60201. If you would like to attend, volunteer or observe one of these classes, please contact Rebecca Weiland at rebecca@nurtureyourfamily.org. Erie Community Health Center will offer pregnancy testing services on a walk-in basis starting Monday, August 12. The federal government’s Department of Health and Human Services recommends that women begin receiving prenatal care during the first trimester so providers can identify and address potential issues as early as possible. The new pregnancy testing service will include counseling, benefits assistance and linkage to Erie as a medical home. Erie also provides immunizations, dental and physical exams and sports physicals to make sure children start school healthy and ready to learn. Dental exams are required for students entering kindergarten and second and sixth grades. Physical exams are required for pre-kindergarten, kindergarten, sixth grade and before entering high school, as well as for all students who are new to the school district. Parents can call 847-666-3494 to make an appointment. Construction is continuing on Erie’s new permanent location on Hartrey Avenue in Evanston with move-in there scheduled for November. Until then the center is operating from the Evanston Civic Center at 2100 Ridge Ave.
Find more information on our Pregnancy, Childbirth and Adoption page. District 65 Family Center offers monthly programs and activities that support healthy development of babies birth to three years old. The Healthy Pregnancy Healthy Baby program will share research-based materials, prenatal/postnatal tips as well as healthy ways to care for your baby as he/she grows. The Pediatric nurses from Evanston Hospital are looking forward to sharing helpful information, resources, and answering questions about your baby. Dinner will be served following the workshop and childcare is provided. Pre-registration is required. Please call District 65 Family Center at 847-424-2440 to register or stop by 1500 McDaniel Ave.
Thursday, January 24, 2013 from 5:00 to 6:45 p.m.